Pages 1-17, Stephen Few's Now You See It, Analytics Press, 2009. 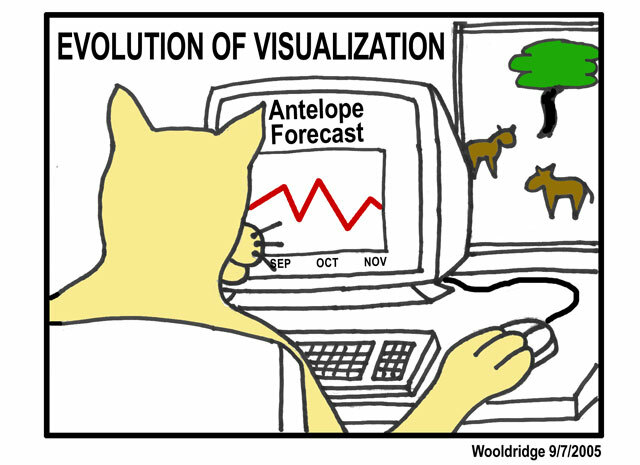 The Beginner's Guide to Data Visualization. Exploratory Data Analysis Due Friday Feb 26, 9pm. Three Blind Men and An Elephant, Stephen Few, 2007. Chapter 2 from Now You See It. Graph Design I.Q. Test, Stephen Few, 2009. Polaris: A System for Query, Analysis, and Visualization of Multidimensional Relational Databases, Stolte, Tang, Hanrahan, IEEE TVCG 8 (1), 2002. Chapter 1 from Visual Display of Quantitative Information. Tufte. 12. Wed, Mar 3 Talk by Ben Shneiderman, Information Visualization for Knowledge Discovery. 12:00pm - 1:00pm, Banatao Auditorium, Sutardja Dai Hall. Visualization Critiques Due Wednesday, March 17th, 9pm. Chapter 2 from Visual Display of Quantitative Information. Tufte. The Eyes Have It: A Task by Data Type Taxonomy for Information Visualizations, Shneiderman, Proc. IEEE Conference on Visual Languages, Boulder 1996. (optional background) Space-scale diagrams, Furnas & Bederson, CHI 1995. Network Visualization by Semantic Substrates, Shneiderman & Aris, IEEE TVCG 2006. Multidimensional Detective, Inselberg, IEEE Infoviz Symposium, 1997. Stephen Few on Parallel Coordinates, Business Intelligence Network, Sept 2006. The attribute explorer, Tweedie et al. CHI 1994. A review and taxonomy of distortion-oriented presentation techniques, Y.K. Leung and M.D. Apperley, ACM Transactions on Computer-Human Interaction, Vol. 1, No. 2, June 1994, pp. 126-160. Evaluating the effectiveness of spatial memory in 2D and 3D physical and virtual environments, Cockburn and McKenzie, CHI 2002. Animation: From Cartoons to the User Interface Bay-Wei Chang, David Ungar, UIST 1993. (optional) Animation: Does It Facilitate? Barbara Tversky, Julie Morrison, Mireille Betrancourt, International Journal of Human Computer Studies, v57, p247-262. 2002.